Hello fellow readers! For this week, I’m proposing you a track from the very talented electronic music pioneer Ruth White. She had quite an extensive career, her most famous record is maybe “Flowers of Evil” (1968) in which she puts into music some of the most striking Baudelaire’s poems. For an extensive look on Ruth’s work and career, I suggest you to visit this blog, which maybe is the best online source about her. The track I’m posting here, tough, is from her 1971 album, “Short Circuits”, in which Ruth plays with a Moog her favorite classical pieces, reinterpreting them and giving them a quite unique flavor, one of them being a complete rework and thus being credited to her directly. This Chopin piece is one of my favorite from the record. I considered posting Satie’s Gymnopedie No. 1 which is also present, but then I decided to put a less known (and listened) piece instead. Massive Ego is a very interesting Wave / Goth / Electro act from UK. According to their bio, they formed in 1996, released their first album in 2006, got a long recording hiatus and then came back with new releases in 2014 (with EPs) and finally released the Beautiful Suicide double CD in February and are currently touring Germany supporting Blutengel (if you are interested, you can check the dates on their official site). What makes them really interesting to me is their ability to mix different styles (EBM, classic wave…) in a very fresh way. They don’t sound stale or phony, like many other releases do. It’s nothing revolutionary but this new album is a very good work. I’ve reviewed a new rare movie, the very brilliant Break Up by the maverick and explosive Italian director Marco Ferreri, who gained notoriety for his very polemic movies in the ’60 and the ’70. 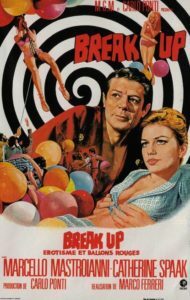 I found Break Up to be a very fresh movie, in spite of it’s age, talking about topics that are still very actual. I plan to start some new music again, more or less regularly, and have some more reviews and article to bring online, I hope in a relative short time. In the mean time you can read Break Up’s review here.